The McScribble Salon: Paperback Release! 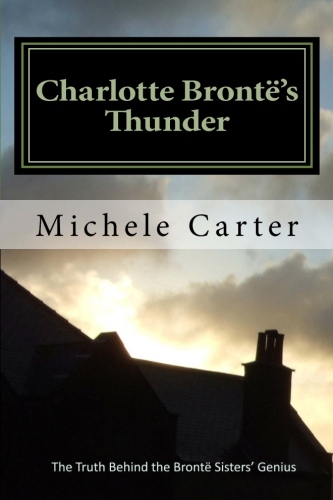 We finally succeeded in producing a paperback edition of Charlotte Bronte's Thunder. For the next couple of weeks it'll only be available at CreateSpace, Amazon's 'Print on Demand' store. Takes time to get to the other outlets. The company only prints the number of copies requested. Nothing extra, so no remainders sitting for months on dusty shelves at bookstores. The print edition will allow people who don't have e-readers to enjoy this unusual biography of Charlotte Bronte. It's more expensive than an e-book but you don't have to buy a reading device. At over 500 pages, we think it's a good deal. After 7 years of writing and researching, it's a thrill to hold the actual book in my hands. I had been working off a computer screen for all those years and never actually imagined the size of the book, so when I received my proof copy I couldn't believe it. It's huge! When did I write all that? The book analyzes my theory that Charlotte wrote all the Bronte novels. A shocker, I know, but the evidence is pretty convincing. I'll leave it up to you to decide.